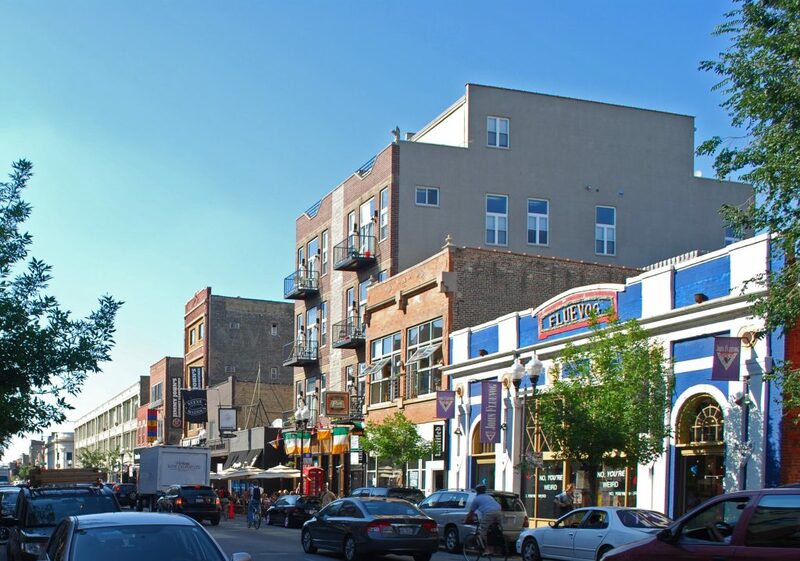 For creative people with discerning palates and eclectic tastes, there’s no more exciting neighborhood than Wicker Park. It’s full of uniquely crafted bars and cafes, as well as vintage shops and high-end boutiques. The small buildings give the area a true neighborhood feel. When you arrive, with the help of your Wicker Park movers, you’ll find residential streets of historic homes combined with modern “luxury” and shabby-chic condos. It won’t be long before you’re ready to explore every nook and cranny of the neighborhood. You’ll have about 52,000 neighbors in Wicker Park, about half-and-half women and men, with a median age of 30. People in Wicker Park have a range of educational and professional backgrounds, and tend to live as couples or roommates. A few have children. They earn an average yearly income of $90k. Wicker Park has officially been part of Chicago pretty much since the beginning. In the mid 19th century, it was the site of various manufacturing industries and attracted a large Irish community. Over the next decades, especially following the Chicago Fire of 1871, more businesses and cultures followed, and the neighborhood flourished. While the area declined during the 20th century, it saw regeneration in the 1970s, and has recently flourished more than ever. Now you’ve got the gist, here are some highlights—and basics—we found to help you start your Wicker Park life. Wicker Park. The park. Community spaces and playground. Wicker Park/Bucktown Farmers Market. Sundays, June through October. Flat Iron Arts Building. For working artists and public exploration. Myopic Bookstore. Four stories of used books in all genres. Reckless Records. For all kinds of disc-shaped media (and consoles, too). Chopin Theatre. Original live performances and arts events. Wicker Park Fest. Annual quality music and art. Pizza: Craft Pizza. BYOB, and delivers within one mile. Tacos: Antique Taco. Also delivers. Has cooking classes and event space. Middle Eastern: Sultan’s Market. Cash only, counter service or delivery. Barbeque: Lillie’s Q. Brunch, beers, and moonshine. Meatless: Handlebar. Vegan, vegetarian, and pescatarian friendly. Dessert: Mindy’s HotChocolate. Great entrees, too. Family friendly. Cocktails: The Violet Hour. Classic crafted mixes. Look carefully for the entrance. Beer and Sausage: Bangers and Lace. Also cocktails and other food. Live Performances: Subterranean. Music and more. Check calendar listings. Dancing: Debonair Social Club. Multiple floors of music and events. Gaming: Emporium Arcade. Huge range of games and events. 21+. High Energy: Swig. Full menu, game watching, DJs. Low Key: Nick’s Beer Garden. Patio, bar games, music. Intimate: The Revel Room. Like a vintage library. Olivia’s Market: Local products and housewarming gifts. Carnicerias Guanajuato: Mexican butcher and groceries. Intelligentsia Coffee: Close to the blue line. Goddess and Grocer: Light meals and grocery items. TOMS Chicago: Browse world-conscious shoes while sipping. Wicker Park Fitness: Local, offers equipment and classes. Orangetheory Fitness: Coaching and group motivation. Lake Shore Verge Fitness: Equipment, classes and Crossfit. Wicker Dog Friendly Area: Heart of the neighborhood. Walsh Park: Features dog friendly area. This has been a tiny sampling of the great things you’ll experience at your new Wicker Park home. As a seasoned Wicker Park moving company, we’ve learned all about the staples and cool places in the area. We’re happy to share more! As you’re planning your big move, cross one major thing off your to-do list, and book Wicker Park movers who’ll a take load of stress off your mind. Call us at New City Moving, and we’ll help you move safely, smoothly, and on-schedule, so you can settle right in and start living your greatest Wicker Park life.